“Only 65 papers of the 12,000 in the Cook study explicitly support the view that human activity is more than 50% responsible for the global warming. The false claim of 97% consensus is a manipulation of data which fuels cult-like hysteria, not scientific inquiry,” says Len Maier, President of Friends of Science. In October 2012 the UK Met Weather office reported that global warming stopped 16 years ago. The recent Cook et al paper reviewed abstracts of thousands of peer-reviewed scientific papers on global warming. 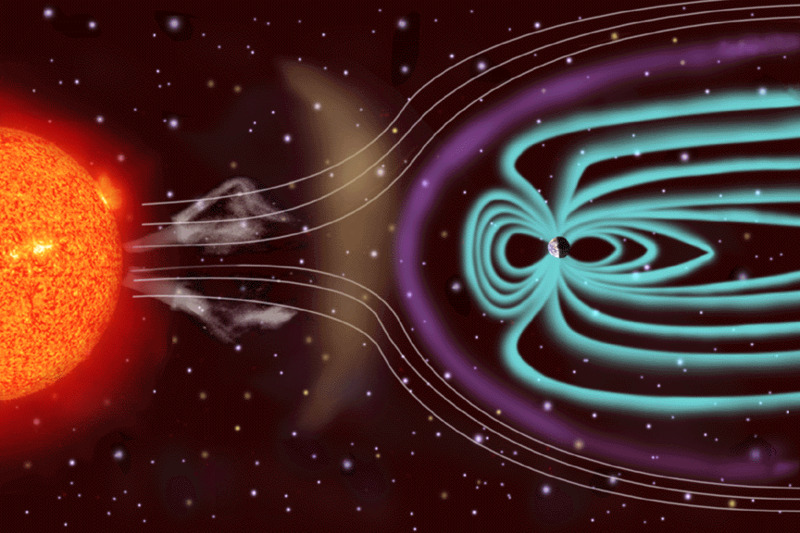 “Climate change is real, normal, and mostly caused by the sun’s magnetic flux,” says Maier. Friends of Science have studied climate science for over a decade. Based on the evidence, they conclude that the sun is the main driver of climate change, not human activity or carbon dioxide (CO2). “Whether scientists agree that human activity affects climate in some ways is not relevant,” adds Ken Gregory, director of Friends of Science. Human activities that affect climate are many: industrial farming, urban development, black soot – but none of these are about CO2 emissions. Gregory goes on: “What portion of the warming up to 2001 was caused by human activity, what part was natural? What part was caused by urban warming and black soot aerosols?" “The study does not address any of these,” he says. Gregory points out that scientists can agree on the evidence that temperatures had warmed until 2001; but since then global warming has stopped. "Most global temperature datasets show a slight decline in temperatures since 2001,” he says. “Many scientists who study solar influences on climate are forecasting a Little Ice Age cooling based on historic solar cycle patterns." “In our view there is overwhelming scientific evidence to support the solar-magnetic theory,” says Gregory, referring to the massive fluctuations of the sun’s magnetic fields that directly impact earth's climate. "You’d think 1150 years of evidence of the sun driving climate change would have more credibility than climate science computer models,” says Gregory. “The computer models failed to predict the global cooling from 1945 to 1975, or the cooling since 2001." 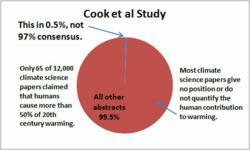 Gregory shows that the Cook study outright falsified scientists’ position based on Cook’s own rating. One astrophysical paper by Nir Shaviv (2005) that studied the sun and cosmic rays was rated as "explicitly endorsing" the AGW theory by Cook et al. In fact Shaviv does not endorse the so-called ‘consensus’ science. 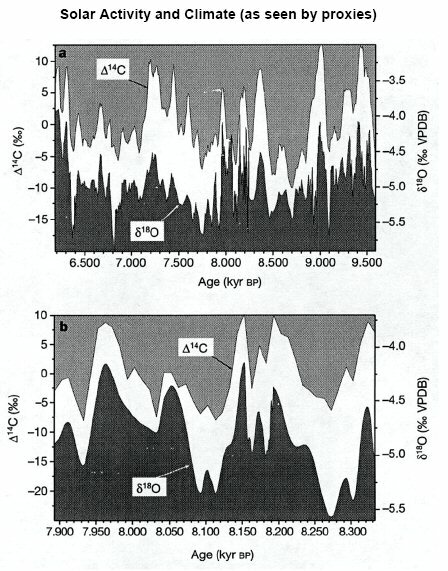 His paper shows that about 60% of 20th century warming was caused by the sun. Shaviv’s commentary “Carbon Dioxide or Solar Forcing?” is popular with the public. Gregory points to another paper by Scafetta and West (2006) concerning solar activity , was rated in the Cook study as presenting an "explicit endorsement >50% warming caused by man". In reality, the abstract states, "We estimate that the sun contributed as much as 45–50% of the 1900–2000 global warming." Cook incorrectly categorized this paper as agreeing with the AGW theory, when the Scafetta and West see the solar effects on climate as more significant.